The News on 6 reports. I appreciated Wayne Greene's well-written column on the Henry Scholarships ("Vouchers lite," Aug. 22). Greene says that "public funding could start flowing into private schools pretty quickly," but I don't see that as reason for concern because, indeed, it's been flowing for quite some time now. Whether it's Oklahoma preschoolers attending private daycare centers, or school districts paying private companies to provide online education, or students using Pell Grants to attend private colleges, public money flows to private organizations all the time. Greene says "education is a public task," but just because the government provides services doesn't mean the government has to produce all of them. Just as Medicaid patients can go to private hospitals, and food-stamp recipients can shop at privately owned grocery stores, students should be able to go to privately operated schools. "The right of parents to choose the schools that children attend is an internationally accepted norm," says Boston University education professor Charles Glenn, a former education bureaucrat for Gov. Michael Dukakis. "Every country in the world except North Korea, Vietnam and Cuba allows parents to choose schools. Every Western democracy except the United States provides public funding to support those choices." In short, "public education" simply means producing an "educated public." And that requires all sorts of different schools. Policymakers ought not view the government as the default setting, as some sort of privileged player when it comes to educating children. Janet Barresi, a candidate for state school superintendent, isn't quite willing to dub a child "proficient" in math if he scores a 44 (or even a 64) on a test. A California school district is forcing preschoolers to wear tracking devices. "Contracted workers are laying artificial turf on the Alcott Middle School football field after finishing the same task last week at Norman North High School," The Oklahoman reports. "The synthetic turf purchase and installation, along with the removal of old turf at each school, was budgeted at $1 million." CNN interviews newly elected state Representative Elise Hall, a 21-year-old college student (and homeschool graduate). The parents of special-needs students in Oklahoma can now apply for scholarships that allow their children to attend private schools, state Rep. Jason Nelson said today. "The Lindsey Nicole Henry Scholarships for Students with Disabilities Program Act became law today, and it's very important that the families of special needs children are aware of this opportunity and take advantage of it," said Nelson, R-Oklahoma City. "This program creates new opportunities for many children who would otherwise be unable to obtain educational services truly tailored to their unique needs." "Having visited with many parents of special-needs students, I know how important this scholarship program is to those families," Nelson said. "It will allow those parents to provide the best education and best future possible for their children beginning this school year. Every parent interested in this program should take advantage of it." The indispensable Mike Antonucci explains how Big Ed uses money to win friends and influence policy. State Rep. Jason Nelson has the details here. "For the second time in two days, the Edmond School District is defending itself after a school bus mix-up," KOCO reports. "An Edmond mother said her sons were dropped off in the wrong place on Wednesday. The boys were later found wandering around an apartment complex about a half-mile away from their home." I wouldn't worry about it. Nothing much ever happens at Edmond apartment complexes. "A Craig County school district’s online learning program aimed at students whose parents prefer to opt out of traditional bricks-and-mortar schools was accredited Thursday by a sharply divided state Board of Education, which also placed the district on probation with strict requirements," the Associated Press reports. Dinosaurs and lefties on the state Board of Education, apparently unaware that the world is changing, look silly as they cling desperately to the status quo. There's no putting the genie back in the bottle. Indeed, none other than the superintendent of the Union Public Schools in Tulsa is boasting that her district is working to give students more virtual learning opportunities, making virtual courses available from E2020 and the Florida Virtual system. You think the status quo is working? According to "Yes We Can: The Schott 50 State Report on Black Males and Education," two-thirds of Oklahoma's black male students score "Below Basic" in 4th grade reading. Only 52 percent of Oklahoma's black males graduate from high school. I'm not sure it's appropriate for Union Public Schools superintendent Cathy Burden, while on the clock and addressing her employees, to be praising State Question 744 or to be thanking Congress for plunging our grandchildren deeper into debt. But I do know this: When bemoaning the insufficient "commitment to education" from the taxpayers who pay your $207,146 salary, it's probably best not to remind folks that "the new turf at the stadium is eye-popping." "It’s the hot new public-sector trend," Cato's Adam Schaeffer writes: "massively expensive K-12 school buildings." Fortunately, voters in the Guthrie School District overwhelmingly rejected an $89.8 million (not a misprint) school bond issue yesterday that would have raised property taxes almost 24 percent. After thrice being named New York City Teacher of the Year, and then New York State Teacher of the Year, John Taylor Gatto took to the op-ed page of The Wall Street Journal to quit his job, claiming he was no longer willing to hurt children. Lew Rockwell interviews him here. One Oklahoma kindergartener went missing for two hours, while other students say that beats the heck out of going to school and getting bullied. The Oklahoman and the Tulsa World are the two largest newspapers in the state. What's third? The Lawton Constitution? Norman Transcript? Good guesses, but the correct answer is The Baptist Messenger, now under the capable leadership of executive editor Douglas Baker. Almost 2 million students are now homeschooled (almost 3 percent of the entire school-aged population) and there is no sign of decline. School choice, charter schools and vouchers dominate discussions of education reform. The need is so critical that even politics is often put aside to address the root of the problem. Adapting educational opportunities and delivery systems to the free market of supply and demand has resulted in shocking discoveries for many government and business leaders. When given a choice as to where their children will go to school, most parents prefer options that are not determined by the federal or state government. Rather, they prefer to choose for themselves who will teach their children. Why class-size mandates miss the point. This from California, but I've written about the same concept here at home. "With the number of Tulsa Public Schools sites sanctioned to the Oklahoma School Improvement List likely to double, the district is fielding many more school-choice requests from students' parents," the Tulsa World reports. The next hearing is scheduled for September 14. The Oklahoman reports that Ken Levit, executive director of the Tulsa-based George Kaiser Family Foundation, told an audience of 350 state and community leaders yesterday that the U.S. education system is in need of reform. The nation is facing an education crisis, Levit said. The U.S. has doubled per-pupil spending during the past 37 years, but 15-year-olds in the United States still rank behind students from 22 other countries in science and 31 countries in math, Levit said. "We need to fund innovation first, not business as usual," Levit said. Fewer than one in five Oklahoma students meet the college-readiness benchmarks in all four ACT subject areas, and the state's ACT scores remain static. Former Florida Gov. 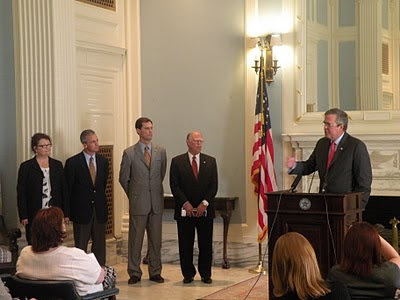 Jeb Bush (pictured here at a press conference in the Governor's Blue Room) was in Oklahoma last week touting school reform. In conjunction with his visit, OCPA teamed up with the Foundation for Educational Choice and the Oklahoma Business and Education Coalition to release this study. The Associated Press report of Gov. Bush's visit is here, and the CapitolBeatOK report is here. "Twenty years after the nation’s first school choice program became law, this month two million students will attend schools of their parents’ choice." The Center for Education Reform compares the two candidates. According to the News On 6, which reports that "Tulsa Public Schools is trying to give a voice to those who suffer at the hands of bullies." Are teachers' unions harming the schools? State Sen. Jay Paul Gumm writes about an "elitist" school system, and I take the opportunity to add a helpful comment. It's no secret that Oklahoma's literacy levels are abysmal. And today in The Journal Record, April Wilkerson reports that "the leaders of several Oklahoma organizations are asking people to consider the effect of literacy levels on health care." 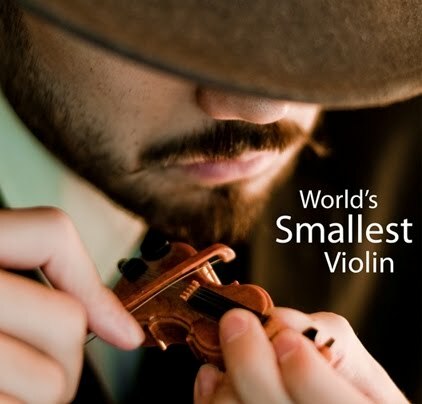 "Nearly 1 million children may have been misdiagnosed with attention deficit hyperactivity disorder, or ADHD, not because they have real behavior problems, but because they're the youngest kids in their kindergarten class," USA Today reports today on the front page. Rick Hess on the Edujobs bill. The state's largest newspaper editorializes on Gov. Jeb Bush's recent visit to Oklahoma. "I was fired for trying to start a union at the United Federation of Teachers." 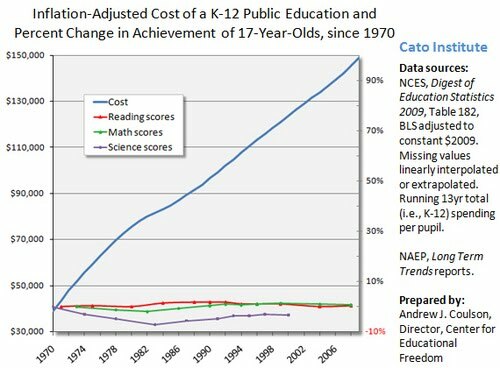 "The question ought to be, is more money spent per student in an unreformed system going to yield rising student achievement? There's absolutely no evidence that more money per student yields higher student achievement." Where in the world did Gov. Bush get a crazy idea like that? "Whoever digs a pit will fall into it," the proverb says, "and he who rolls a stone will have it roll back on him." Wouldn't it be ironic if the teacher union's irresponsible ploy forced legislators to save money via school choice? Comes now Mickey Hepner with a terrific new post on his economics blog, "OKonomics." Dr. Hepner is an economics professor at the University of Central Oklahoma and, significantly, a member of the executive committee of the board of directors for the Oklahoma Academy, a venerable think tank founded in 1967. A self-described "centrist Democrat," Dr. Hepner was (is?) an enthusiastic supporter of Barack Obama. In short, he is not a member of the Vast Right Wing Conspiracy (at least he's never at the meetings). The debate over State Question 744 is all about per-pupil funding, Dr. Hepner wrote yesterday, and there's a way "to raise per-pupil funding without impacting other government programs or raising taxes -- by instituting a school voucher program." 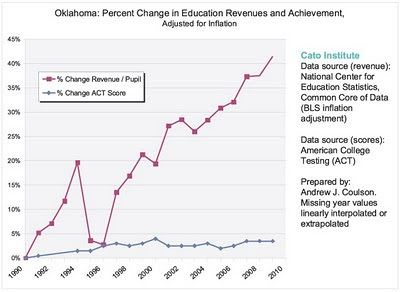 In 2008-2009 Oklahoma education funding averaged $8,006 per student. 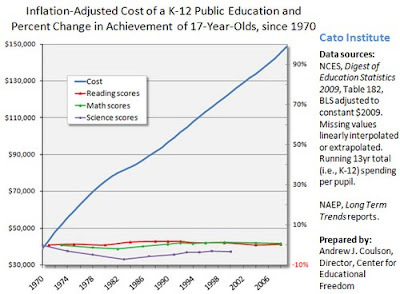 This figure though, is based only on the number of students enrolled in public schools. If Oklahoma was able to shift more students from public to private schools, state funding would be spread out over fewer students, thereby raising the per-pupil average. Of course, the only way to shift large numbers of students from public to private schools is to help pay for private school tuition ... a cost that offsets some of the gains. However, if structured correctly, a voucher system could still generate cost-savings for the state, allowing it to raise per-pupil spending. In short, "the numbers don't lie: if education proponents really want to increase per-pupil spending, they should embrace a school voucher program." Yes and amen. My only suggestion would be to phrase it this way: "they should embrace a school voucher or tax credit program." There's nothing wrong with vouchers, of course, but until Oklahoma can solve its Blaine Amendment problem (preferably through repeal), tax credits are going to be a much cleaner way to go. In any case, Dr. Hepner's blog post is excellent and I encourage you to read the whole thing. Neal McCluskey on the biggest federal takeover you've never heard of. Good editorial today in The Oklahoman. ... is upgrading and growing. First the teacher unions backed a radical, irresponsible spender. 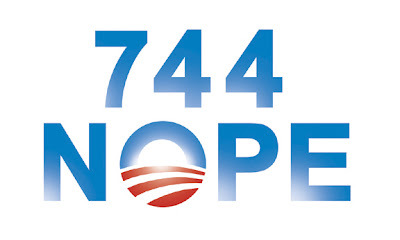 Now they're backing a radical, irresponsible spending scheme. ... is coming to Pennsylvania. A paradoxical people, these Americans: eager to have an incompetent government that they don’t trust do more of the things that they don’t want it to do. So true, and strangely reminiscent of some recent SoonerPoll results here in Oklahoma. Nearly two-thirds of Oklahomans (65 percent) want to raise public school spending to the regional average, yet a nearly identical number (64 percent) don't think more money will cause students to learn more. What to make of these sorts of contradictions? Ferguson, hearkening back to Seymour Martin Lipset, calls them "inevitable artifacts of polling in a country where people are expected to have considered opinions even when they don't." The secret to better public schools (and balanced state budgets)? In stories for CapitolBeatOK.com, senior editor Patrick B. McGuigan of The City Sentinel has detailed devastating national investigations finding that Oklahoma’s Teacher Retirement System (TRS) is horribly underfunded. For Oklahoma taxpayers, a financial crisis of unimaginable proportions lies waiting in the wings, unless the economy grows robustly and/or benefits are cut. The Pew Center for the States found Oklahoma was among the five worst of the 50 states in terms of unfunded mandates in its system. In all, American state governments faced what Pew researchers called a "trillion dollar gap" between promised retirement benefits to public employees and the resources to pay for them. In a later story, McGuigan detailed research from the Manhattan Institute and the Foundation for Educational Choice finding that nationally the gap in government retirement plans is “worse than you think.” A third investigation, from the Institute for Truth in Accounting, estimated that unfunded mandates could cost each Oklahoma family $14,600. In 2007, state Treasurer Scott Meacham said, "The biggest problem exists with the biggest pension fund – the Teachers’ Retirement System – where actuaries indicated that nearly three times more money than is currently received is needed to properly fund the system." But somebody apparently hasn’t read any of this. Management for TRS this year redecorated offices in the Capitol complex in Oklahoma City, at a cost of about $115,000. In San Francisco, an initiative effort aimed at addressing that city’s own nightmarish pension shortfall has emerged from a perhaps unexpected direction. A local public defender joined forces with a retired Silicon Valley entrepreneur to gather signatures needed that could force a popular vote on pension reform. Those pushing reform are “progressive” (i.e. liberal) but in this case they are fiscally quite conservative. The San Francisco initiative proposal would limit future benefits and put new burdens on public employees themselves to help fund their own retirement plans. Public employee labor unions are opposing the effort, but at least a solution is being put on the table.